The PowerMate M-2B is a powered, heavy duty stair climber with a capacity to move loads up to 680kg. The M-2B has eight inches of extra height to accommodate taller loads like built-in appliances, vending machines, coolers, safes, switchgear, and hot water tanks. 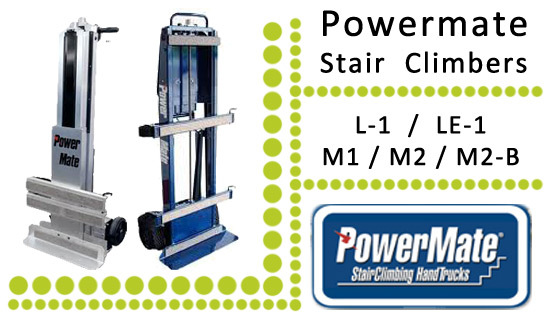 The PowerMate M-2B is four machines in one: a powered stair climber; a powered tailgate lift; a loading dock leveler and a well balanced dolly. The following list provides a quick reference to some of the advantages attributed to the PowerMate M-2B. Due to the extremely heavy lifting capacity of the M Range Powermates it can take multiple personnel to operate this machinery safely.